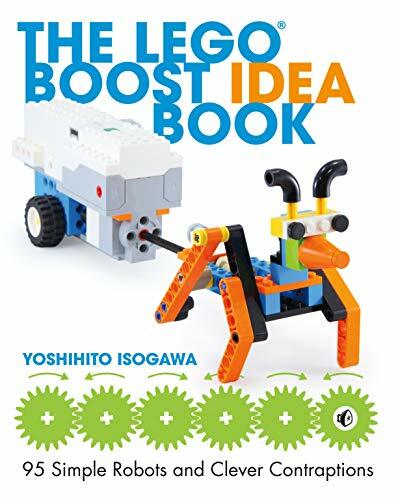 Book Review: The LEGO BOOST Idea Book: 95 Simple Robots and Hints for Making More! As the title suggests, this is an ideas book. It doesn't have any step-by-step building instructions so you'll have to use the photos of the models in various angles to try and build your own model. Anyway, you don't need to build the exact same model because that's not the focus of the book. The goal of the book is to give you ideas on the mechanical actions possible and the type of robots you can build. As long as you build something to replicate the action, you've succeeded. This 252-page book has 95 robot examples. That is a lot. There are robots that move with wheels, legs, and there are cranes, rotating ones, sliding door, and even one that moves like an inch worm. The bricks used are in the LEGO BOOST Creative Toolbox set (#17101) which is sold separately of course. This is a fun book for those who like mechanical stuff and building their own things. It's also a fun challenge to figure things out on your own.